I attended your breaking the silence workshop in our boardroom a couple of weeks ago and following the session I asked for your email address so I could get in touch. Firstly, I thought the workshop was exceptional and I know for a fact that a lot of other people in the room felt the same way. The way you delivered it was considered and powerful and you could tell that it came from the heart. I truly believe that everyone in the organisation should attend to break the stigma surrounding mental health that we talked about as a group. For me however, this was more than just a great workshop. One element had an impact on me on a personal level and in some way has given me a small amount of closure, as well as a greater understanding, for something that I had struggled with for most of my life. When I was 8, my Mother took her own life; very suddenly without any indication. She left behind my Dad with three young children and completely changed our lives. She was a brilliant Mum; kind, loving and thoughtful and it wasn’t until I was older that I really grasped what had happened in the way that it did. Throughout my late teens, I was angry. I couldn’t grasp how she could have left us all, and that if she really loved us, why would she do something that seemingly demonstrated the opposite? It was therefore when you talked about your friend and colleague who had laughed and joked with you all in the pub the night before taking his own life that really hit home with me. My Mum had helped me make a fancy dress costume for school the night before she died and I had always really struggled to understand the thought process behind that. 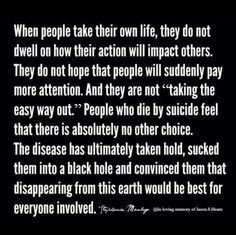 How could someone appear so “okay” whilst privately feeling there was no other option than to end it all? You often hear when people have taken their own lives through mental illness that it was because “they weren’t well” or they “weren’t thinking straight” which I guess is true but it doesn’t make it any easier to come to terms with, nor does it put into context what they must have been feeling. When you talked about people feeling like “it would be the best thing for everyone else if I wasn’t here” that really struck a chord and perhaps explains what my Mum was feeling at that time. I left the session feeling strangely comforted, feeling like I had a few more answers to the puzzle and for that I can only thank you. It really meant a lot. My sister, who is six years younger than me has battled with the same questions and has suffered from depression over the last couple of years. She has had some therapy and we have had some long chats about our Mum and she is now in a better place. Next time I see her in person, I want to talk to her about this session, as I really think it will help her too. I think the work that you are doing is fantastic. Listening to your story, I’m sure it wasn’t easy for you to stand up at the front and bear your soul, but it is definitely worth it and I hope this email goes someway to show that. It was 1995 when she died, and as you said, there wasn’t much support or understanding back then. Who knows, if it was today, she still might be alive and I have no doubt that the work you are doing will help to save someone like my Mum. This entry was posted on Monday, May 29th, 2017 at 1:27 pm. You can follow any responses to this entry through the RSS 2.0 feed. You can skip to the end and leave a response. Who is the Usain Bolt of Mental Health? Bingo Wings or Healthy Minds? Do you stay silent or risk stigma? What is wrong with me in this photo? It’s not rocket science….it’s pants!